No one would have blamed Samsung if the Note 8 were never released. After a global recall halted sales of the Note 7 in their tracks, some execs at Samsung probably floated the idea of retiring the Note brand altogether. It’s good they didn’t. The Note 8 isn’t just a return to form, it’s the best phone Samsung has ever made, bar none. And until the iPhone 8 and Pixel 2 make their appearances—and maybe even after—it’s simply the best phone money can buy. The Galaxy Note 8 has beauty and brains to spare. Mind you, the best phone money can buy doesn’t come cheap. At $930, it’s $100 more expensive than last year’s model and inches ever closer to that psychological $1,000 barrier. But if you don’t have any qualms about dropping a small fortune on something with such a high probability of cracking, you’ll be plenty happy with your purchase (unless, of course, it cracks). Everything about the Note 8 improves upon both the Note 7 and the Galaxy S8+ (even the fingerprint sensor). Barring another catastrophic roll-out, the Note 8 should once again set the standard for productivity phablets. Put the Note 8 and the Galaxy S8+ side by side on a table and you’ll barely see any difference. The Note 8 has the same gorgeous Infinity Display as the S8+, and at 6.3 inches, the screen is a barely perceptible 0.1 inches larger. 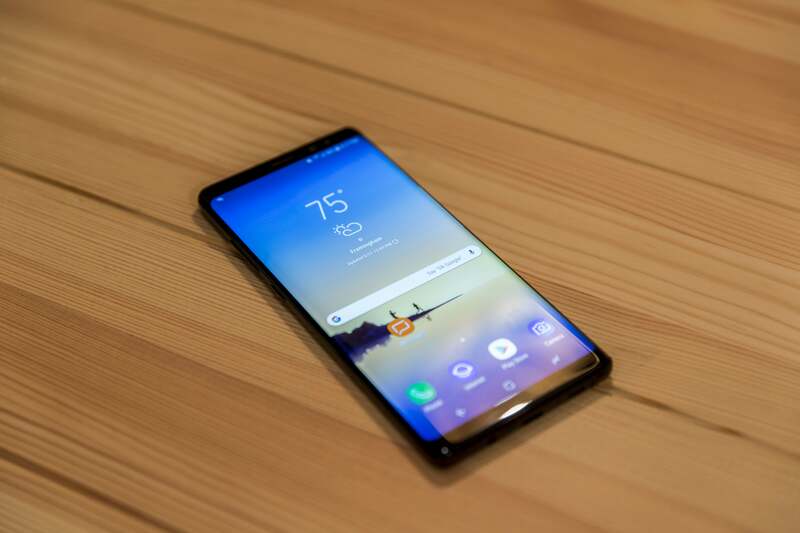 It also has all the same ports and buttons—power, volume, Bixby, 3.5mm, and the off-center USB-C—and delivers the same fast wireless charging and IP68 water resistance. 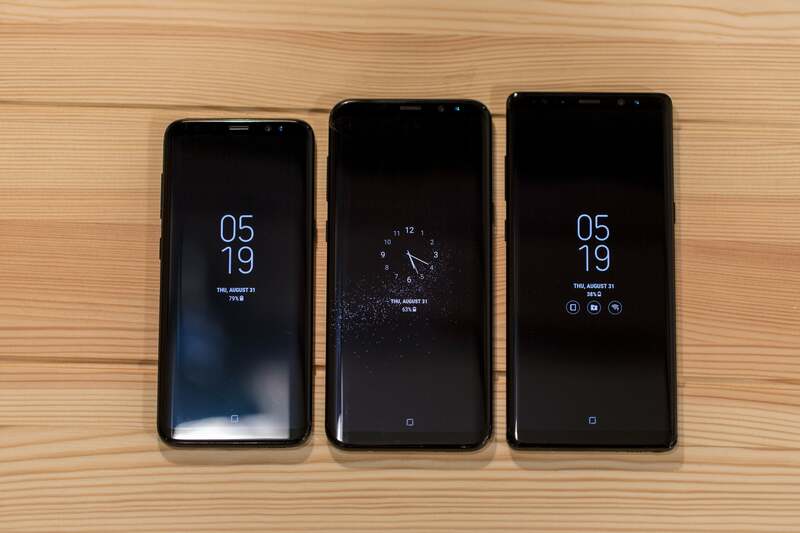 The Galaxy Note 8 (right), is a little bigger than the Galaxy S8+ (center), and a lot bigger than the Galaxy S8 (left). But the Note 8 isn’t identical to the S8+. 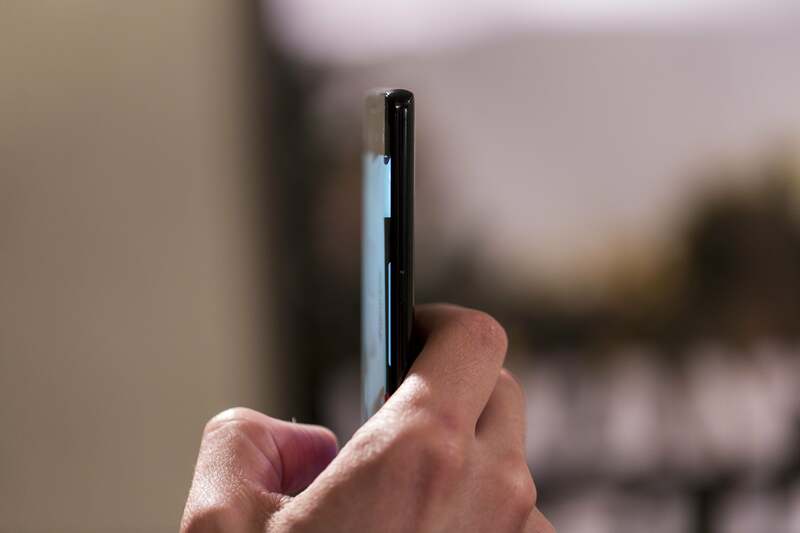 Along with the addition of an S Pen slot on the bottom edge, the main difference is the shape. While the S8 has rounded corners on the case, the Note 8 is more squared-off, making the phone appear even taller than it is. It’s a weird optical illusion that eventually faded after a few days, and I ultimately learned to like the design even more than the S8’s. It’s surprisingly functional, too. I dropped the S8+ almost immediately after I opened up its box (and numerous times thereafter), but the squared-off edges on the Note 8 help me keep a firmer grip. The Note 8 is, however, about 20 grams heavier than the S8+, and the extra weight is definitely noticeable, making the Note 8 feel significantly more substantial. Flip it over and you’ll find the same horizontal camera array, except this time around there are two lenses. The fingerprint sensor is in the same position to the right of the array, though it’s not nearly as terrible to use as it is on the S8. Like the S8, the Note 8 is all about the screen. It’s essentially the same as the one on the S8+: Super AMOLED WQHD+ (1440x2960), though the extra tenth of an inch means the pixel density is slightly reduced (521 PPI vs. 529 PPI on the S8+). Also, the corners of the screen match the squarer edges of the phone, making for nice symmetry. There isn’t much to complain about when it comes to the Note 8’s screen. It’s also a good deal brighter than the S8+. At more than 1,200 nits, the Note 8 is nearly blinding in a dark room, but that makes it eminently readable in direct sunlight. It’s straight-up the best phone I’ve ever used outdoors, and I was able to comfortably read and browse in super sunny spots once I cranked up the brightness. Also, it’s been mobile HDR certified, so it’s ready to play high-dynamic range movies. And there's already some great content, as Netflix has added the Note 8 to its list of supported devices, even before the Galaxy S8 and S8+. It’s worth noting that if you have even the newest Gear VR unit, the Note 8 won’t fit in it. Samsung is selling a new version of the headset that’s identical in every way to the old model, but just a little bigger to accommodate the larger Note 8 screen. That probably won’t affect too many people, because would-be Note 8 buyers likely haven’t purchased one of the new USB-C headsets released alongside the S8. But it’s still strange that Samsung didn’t account for future handsets. 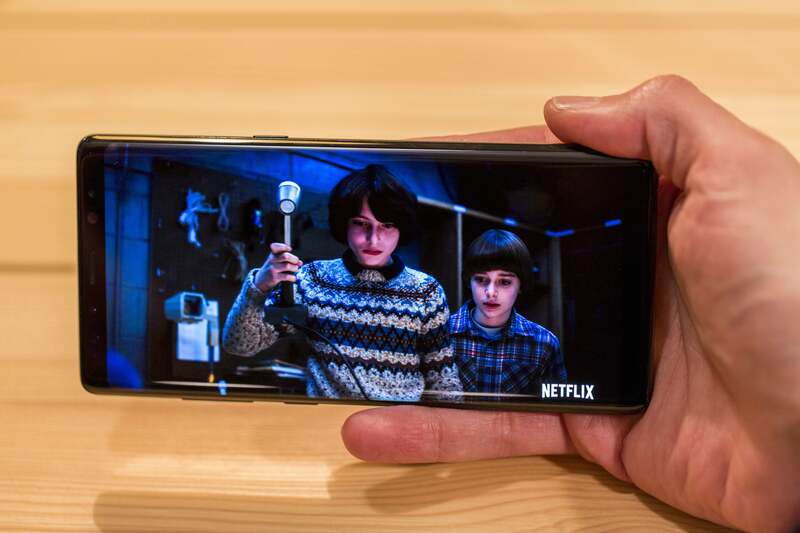 Hopefully Netflix will let Note 8 users watch Stranger Things in HDR this Halloween. Speaking of size, it seems that Samsung has hit a ceiling when it comes to the Note’s display. While most everyone will be able to hold the phone with one hand, using it is another story. I pretty much need two hands to do just about anything on the Note 8, and even with extra fingers at my disposal, I still have to continuously adjust my grip to reach the upper half of the screen. So... Good thing this phone comes with an S Pen! 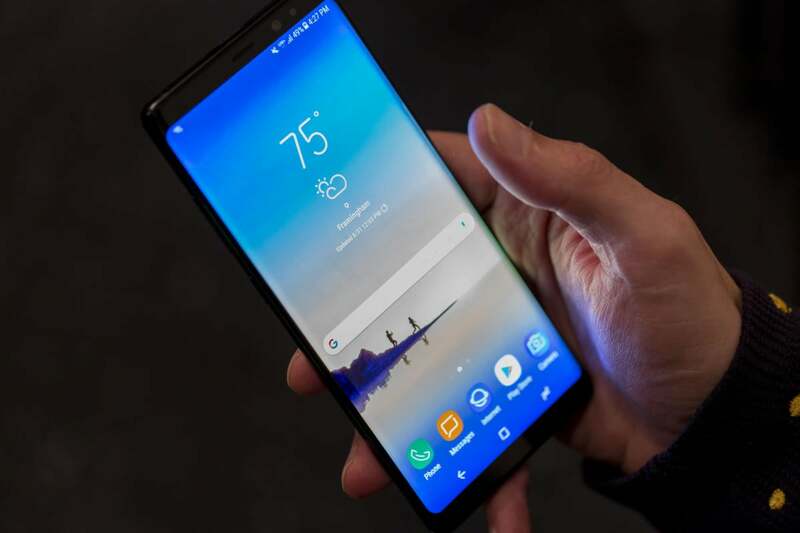 If Samsung fully eliminated the top and bottom bezels, it could probably squeeze out a 6.5-inch display for the Note 9, but anything beyond that will start to look comically tall and be difficult to use. The Note 8 includes the same Snapdragon 835 chip as the S8 and adds an extra 2GB of RAM to bring the total to 6GB. But even with that, the two phones are neck-and-neck in the performance department, whether you’re measuring with benchmarks or real-world use. Inside that slim enclosure is a ton of power and RAM. Over time, the extra RAM will probably help keep the Samsung Experience system running smoother than in previous phones, but I didn’t notice much of a difference between the Note 8 and my 5-month-old S8+. Apps opened and switched quickly, and PCMark scores were in the high 6,000s, as expected. 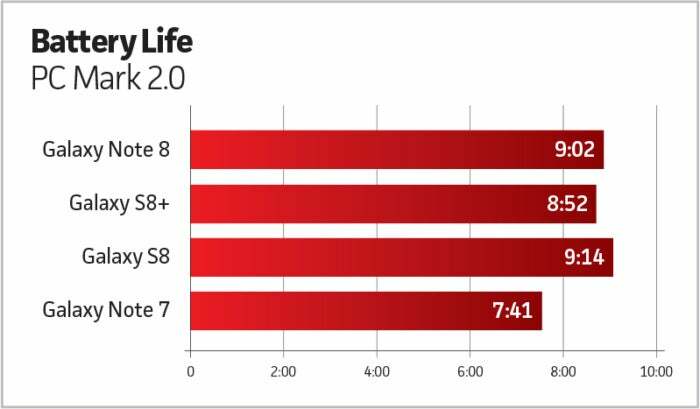 It’s safe to say the Note 8 is at least as fast as any Android phone I’ve used, and even stood up to the iPhone 7 Plus. 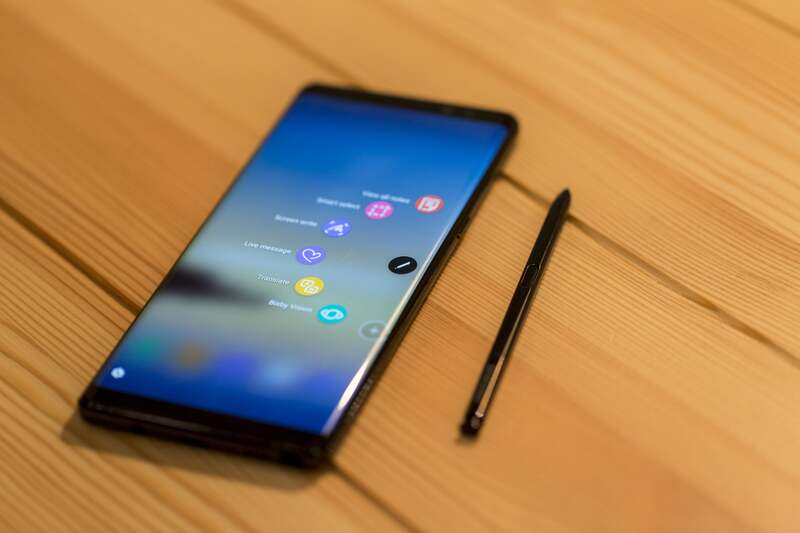 So until the Snapdragon 836 and Apple’s A11 chips make their appearance, the Note 8 will be among the most powerful phones around, and I suspect it’ll hold its own against those next-generation processors, too. As far as unlocking goes, the Note 8 includes the same bevy of biometrics as the S8: fingers, eyes, and face. I still prefer iris unlocking as the most secure and convenient, but the usability of the fingerprint scanner has been improved. While Samsung unfortunately didn’t relocate it from its inconvenient spot on the rear panel, it did switch things up some by putting the LED flash between the fingerprint sensor and the camera, and by adding a thicker border around the sensor. These changes make it somewhat easier to nail the sensor on the first try while also cutting down on camera lens smudges. Still, I’m hoping the next generation of flagship Samsung phones rethinks the position of the fingerprint sensor altogether. Much ink will be spilled on the Note 8’s battery. While the S8 was the first major phone from Samsung following the global recall, the Note name will forever be synonymous with battery explosions. Samsung has taken major steps to make sure Note 8s won’t catch fire. 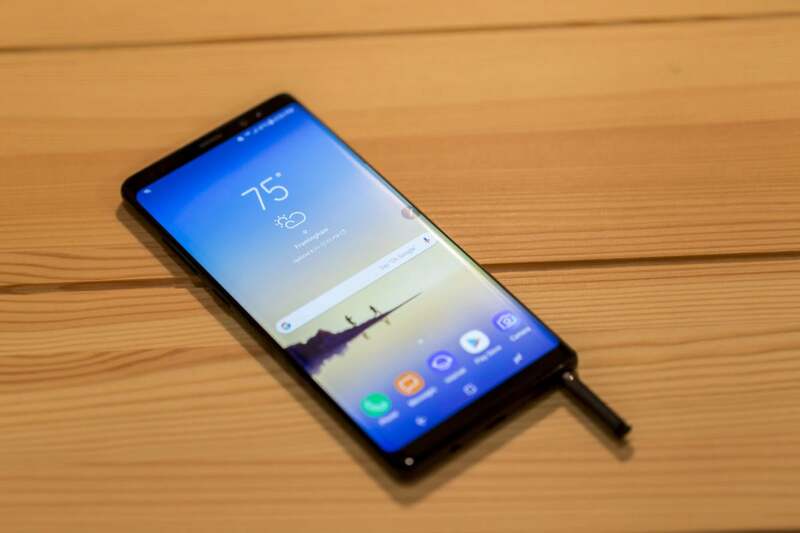 Samsung blamed the explosions on a “flaw in the manufacturing process (that) resulted in the negative electrodes and positive electrodes coming together.” One interpretation says the battery was just too big for its allotted space. In response, the Note 8’s battery is just 3,300mAh, which is smaller than the 3,500mAh batteries in both the Note 7 and the S8+. I’m no engineer, but my guess is that the S Pen slot, the extra rear camera, and an abundance of caution necessitated the downgrade. But fear not, because in my real-world testing, the difference was pretty negligible. Even with a smaller battery, the Galaxy Note 8 lasts just as long as the Galaxy S8+. The Note 8 easily lasted through a full day of heavy use, and benchmarks hit the 9-hour mark, running circles around the Note 7 and even besting the Galaxy S8+. Samsung has clearly spent considerable effort optimizing the Note 8’s battery for the chip and the OS, so there’s no need to risk another disaster by squeezing in a too-large battery just to fill out a spec sheet. Simply put, the battery on the Note 8 shouldn’t be a concern, whether you’re worried about it lasting or exploding. The very existence of a stylus on the Note 8 is enough to set it apart from nearly every other smartphone, but the S Pen isn’t just for comfort and precision. 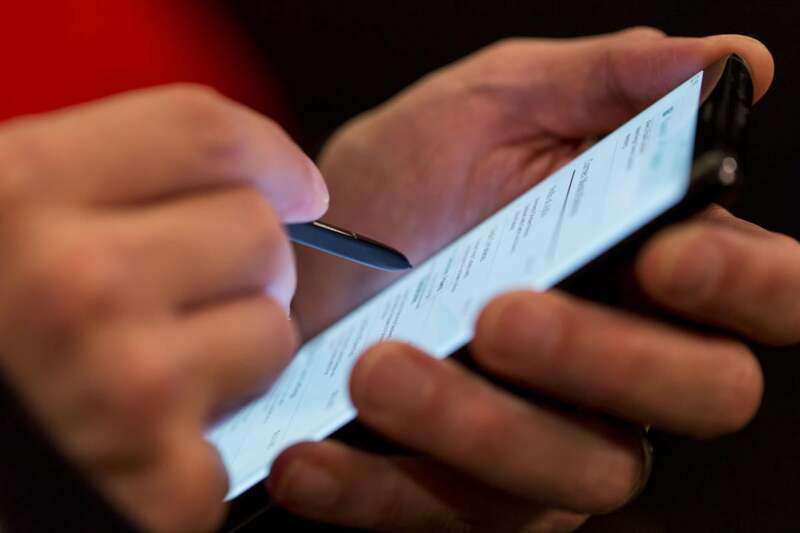 It gives the Note a level of productivity that just isn’t available on other handsets. Aside from a couple of small snags with the springy slot on the bottom of the phone, I loved using the S Pen, and I miss having one on every other handset I pick up now. The pen itself has the same 0.7mm tip and 4,096 pressure levels as the Note 7’s, but it brings a new set of tricks. The S Pen is the Note 8’s secret weapon. And you don’t even have to turn on the screen to enjoy it. Screen-off memos isn’t technically a new feature, but Samsung has upgraded it with the ability to write up to 100 pages of notes, so it could actually replace your notebook, if you’re the kind of person who carries one. The Air Command menu has gotten a few upgrades, with the ability to translate not just words but full sentences. There’s also a Live Message option that lets you send hand-drawn GIFs to your friends. The Note 8 will convince you to love the stylus again. But as good as the S Pen is, what really gives the Note its productivity cred is the DeX dock. Introduced alongside the S8, the $150 accessory turns your phone into a full-fledged desktop computer. The Note 8 fixes a few of the biggest annoyances with the first version. For one, you don’t need to pair your Bluetooth mouse and keyboard before you plug it in anymore. For another, apps are better optimized to take advantage of the desktop format, with many able to continue running seamlessly once it’s plugged in. It might very well be the world’s first phone that can legitimately replace your tablet and your laptop. Even with all the above changes, the Note 8 might simply be an OK upgrade, but probably not one worth nearly $1,000. 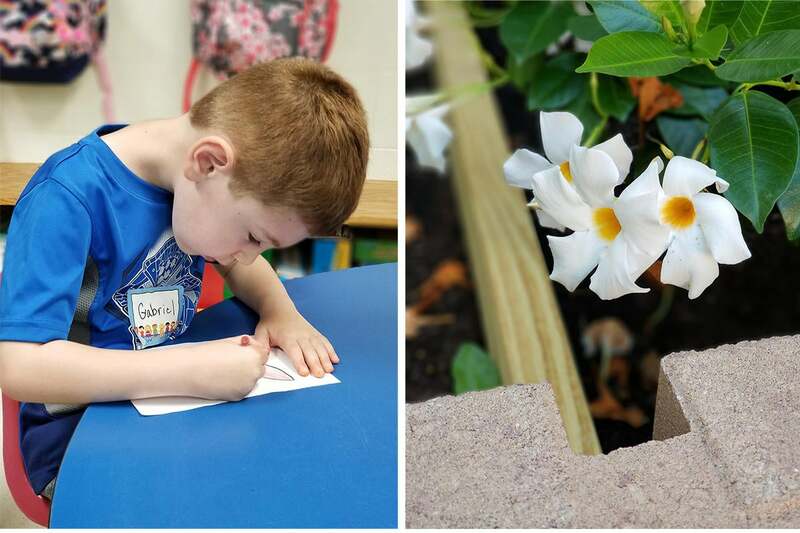 The camera makes all the difference. For the first time, the Note 8 has a dual camera—and the results are awesome. It might not be all that technically superior to the S8’s—in fact, it has the same 12MP Dual Pixel, f/1.7 main camera—but it adds a couple of key features that bring it over the top. 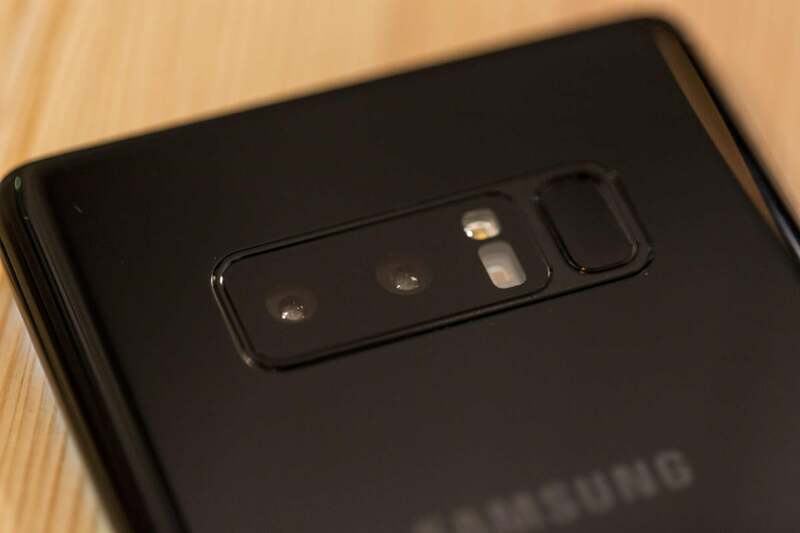 Most notably, the Note 8 has a second 12MP lens with a f/2.4 aperture, and in tandem, the two cameras offer 2x optical zoom. Plus, there’s optical image stabilization in both cameras. That makes the Note 8’s camera more versatile than what came in earlier Galaxy phones, letting you capture clearer photos from farther way and take far better portraits than the selective focus mode on the S8. The Galaxy Note 8’s optical image stabalization (left) really came into play when the lights were turned way down, capturing more clarity and detail than the Galaxy S8+ (center) and the Pixel (right). Faux bokeh on smartphones is hardly a new concept, but Samsung has clearly done its homework. Tapping the Live Focus button activates a mode similar to Apple’s Portrait mode. The images I was able to get were as good as the ones on the iPhone 7 Plus. But the processing magic on the Note 8 isn’t just behind the scenes: Both before and after you take your photo, you can adjust the intensity of the background blur with a software slider. It might sound like a party trick, but it’s way more than that. The adjustments I was able to make with the Note 8 regularly turned bland portraits into excellent ones, and it’s a feature every dual-camera phone should copy. I consistently captured remarkable portraits using the Note 8’s Live Focus mode. The Note 8 took fantastic non-portrait shots too. While it didn’t pack quite enough technical prowess to take down the LG G6 in our in-depth camera showdown, the pictures I took with the Note 8 were sharp and rich, with even better color accuracy than the S8’s. In low-light situations, the OIS really shined, capturing superb details in the harshest of light. The camera app in the Galaxy Note 8, left, has made things easier to find compared to the one on the S8 (center). 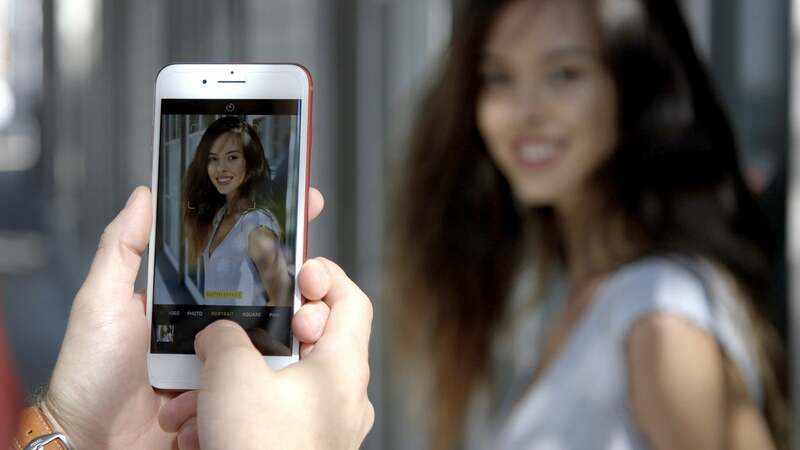 But the killer feature is the slider to adjust blur after snapping a Live Focus shot (right). 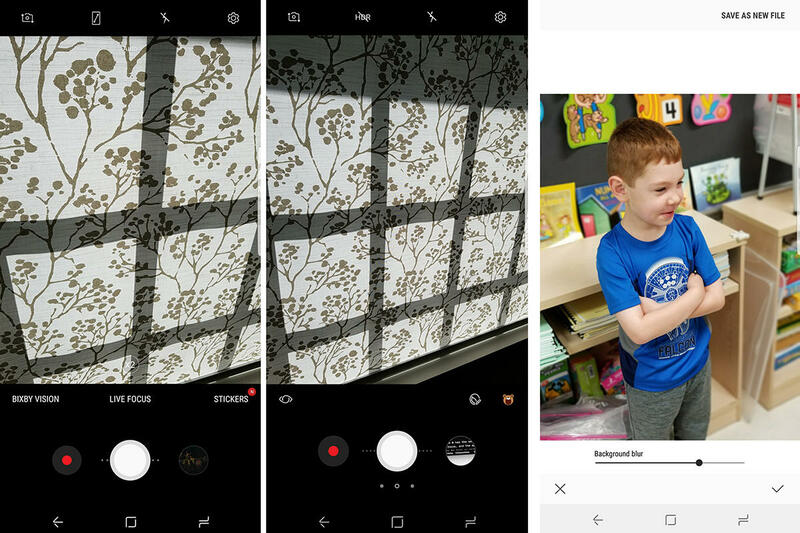 Samsung has also cleaned up its camera app to make things easier to find. The buttons for Bixby and stickers are clearly labeled, and the download button, which lets you add new shooting modes, is placed with the rest of the other options, so more people are likely to use it. There’s also a new full-screen icon to use the whole display as a viewfinder—much easier to find than digging into the settings and figuring out which picture size to select. Around the front, the Note 8 has the same 8MP, f/1.7 aperture camera with auto focus, and the app is loaded with stickers and filters to jazz up your selfies. 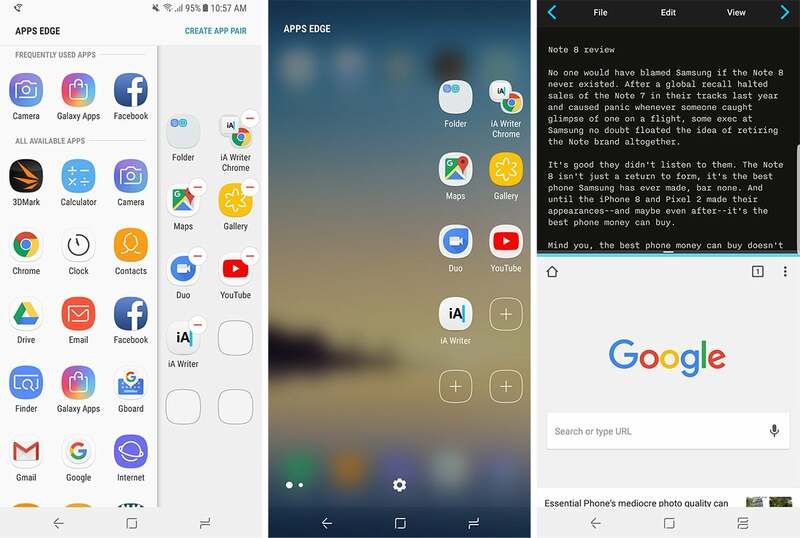 The Note 8 is running the Samsung Experience based on Android Nougat 7.1.2, a newer version than the 7.0 one on the S8. It doesn’t bring any visual changes that I could see, but there is at least one new feature worth mentioning. It’s called App Pair, and it’s a perfect match for the Note 8’s giant screen. The new App Pair feature on the Note 8 lets you select two apps to automatically launch together into Multi-window. It’s a little tricky to find, but App Pair is worth seeking out. It lives in the Edge Panel, and lets you pick two apps to launch at the same time. You can set it up the same way you select apps icons, but instead of one shortcut, you’ll put two together. When you tap the icon, both apps will automatically launch into Multi-window. It’s probably not a feature I’d use every day (and during this review, I didn’t), but taking away the need to fiddle with the Recents screen to activate Multi-window is a welcome change. I can’t finish this review without mentioning Bixby. Unlike at the S8’s launch, it’s now a fully-formed assistant, with voice recognition and multi-step commands at the ready. As Bixby matures, it’s becoming clear that Samsung wants it to be more of an on-phone tool than a knowledge database, and Bixby does come in handy every now and again. That said, it just doesn’t need to have a dedicated hardware button. I accidentally launch Bixby way more often than I deliberately summon it. I’m hoping Samsung adds the Bixby button to the list of things it needs to rethink in next year’s phones. If you’ve gotten this far in the review, you’ve probably noticed that I’ve given the Note 8 a 5-star rating. 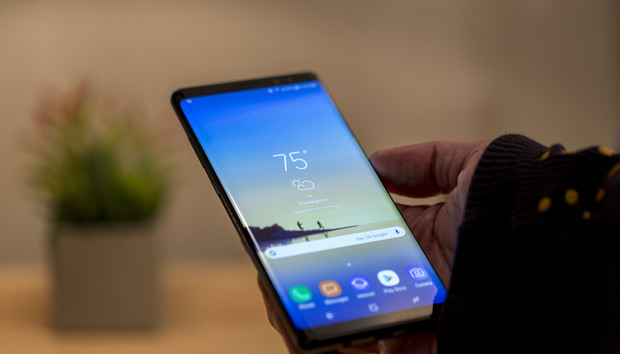 It’s not a score PCWorld hands out lightly—I’ve personally never given one until now—but there’s no denying what Samsung has delivered here. The reasons why the Galaxy S8+ lost a half-star in my review were primarily Bixby’s half-baked launch and the location of the fingerprint sensor, and both have been fixed to the point where they’re much less consequential to the experience. The Note 8’s improvements far outweigh the remaining negative points. It’s like the monolith in 2001: A Space Odyssey... if it had a 6.3-inch screen and a stylus. But there’s no denying that the Note 8 is an expensive phone. In fact, if you use the 64GB storage option as the comparison point, it’s the most expensive phone you can buy. But as the 5-star rating attests, it’s also the best phone you can buy. Sure, the iPhone 8 and the Pixel 2 are right around the corner, and LG has made a real contender with the V30. But because the Note has so many things going for it, it’s safe to say it’ll be able to hold its own against any of them. The S Pen alone delivers such unique functionality. If price is your only sticking point, know that Samsung is offering the choice of either a Gear 360 camera or a 128GB microSD card with a fast wireless charger for orders through Sept. 24. And if the S8 is any indication, there will be other offers to follow. The Galaxy Note 8 and the S Pen, perfect together. Even if you pay full price, you won’t regret it. 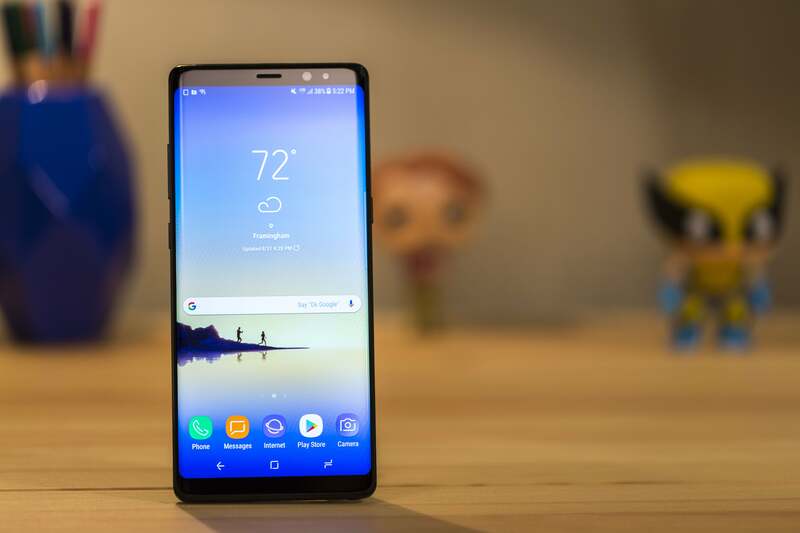 The Note 8 is nothing less than a brilliant return to form, with an industry-leading screen, stylus, and camera, and a simply stunning design. It’s so good, you won’t even mind all the bad exploding battery jokes you’ll have to endure from your friends. « Galaxy Note 8 vs. LG G6: Can Samsung beat LG for the camera phone crown?